Styled with essonne skirt and garrand sweater . Known for their cozy sweaters, Wilfred specializes in the use of elevated Italian yarns. The Charlisa is knit with 100% merino wool in a patchwork style, with alternating cable and straight stitches. Remix your knit. Very comfortable and warm cardigan. Looks beautiful and the quality is good. After reading all reviews I ordered size down and it fits well. I ordered xxs, but my regular size is xs. I'm 170 cm, 54 kg. Cider gold is a beautiful color. I ordered up for the cute over sized look, but it didn't work out. Runs a tad large. If you are normally a small, then order a small. it will seem large but that's the way it should be. if you wash it in the handwash/wool cycle in your washing machine then it will cover any shrinkage issues when it air drys. The sweater is very soft and luxurious. The fit is very relaxed, and the sleeves are quite long. You can tell just by seeing this sweater that it’s a great quality garment! 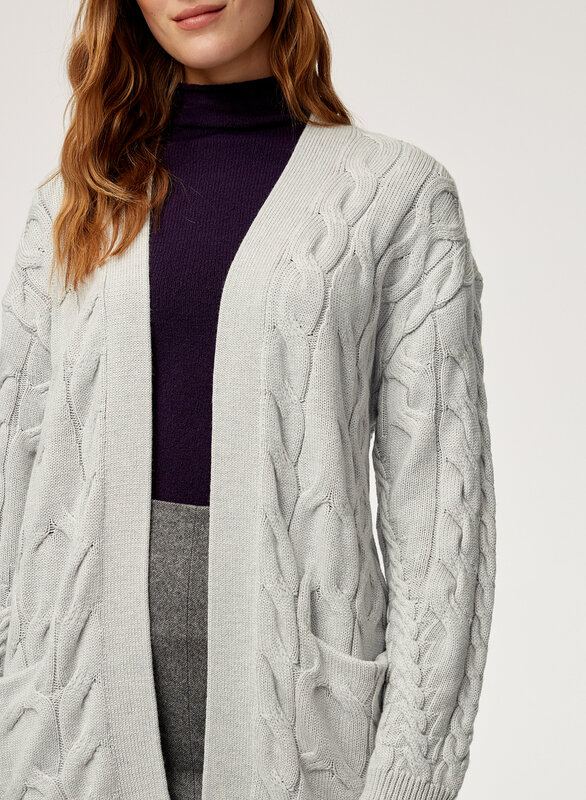 This cardigan is dressier and works for me at work! I got so many compliments. Well made and perfect fit. I’m 5’2 and 145lbs and bought the medium to get a roomier fit. I wear it everyday. This is a cardigan that goes well with jeans and matches anything. I really love this sweater. It’s thick and warm without being itchy. I go between a medium and a large in most tops. I choose to go for a medium and I like the fit, it’s looser but not oversized. 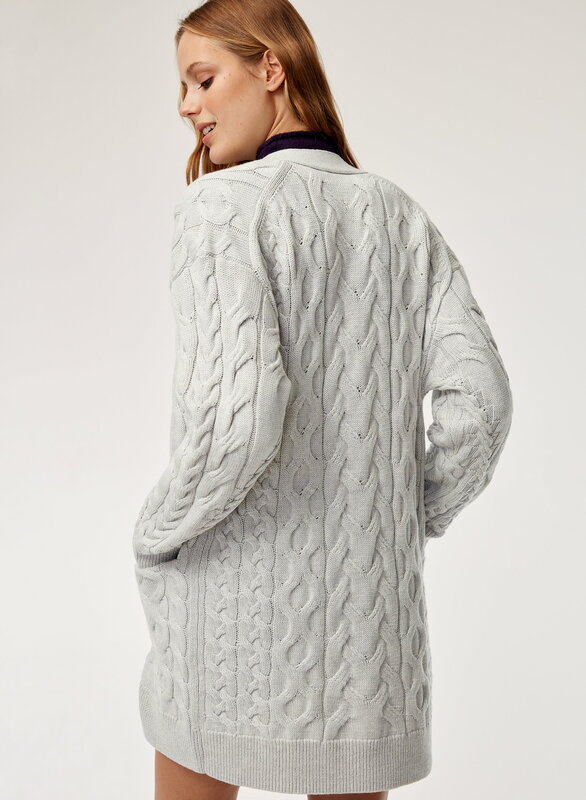 I absolutely loved this cardigan, As usual quality is the best, only this cardigan is a little oversized, so if you like the oversized style but that doesn't fit that larger pick a smaller size. I kept mine but if I would have to buy again I would pick the extra small, I am regularly a small. I loved my mustard color! so different. I got the olive colour, great neutral to spice up my usual black/grey cardigan wardrobe. Doesn’t itch, it’s soft and easy to wear. Originally ordered a S cuz I wanted the oversized feel but was way too big esp in the shoulders and sleeves, exchanged for an XXS and fits great. 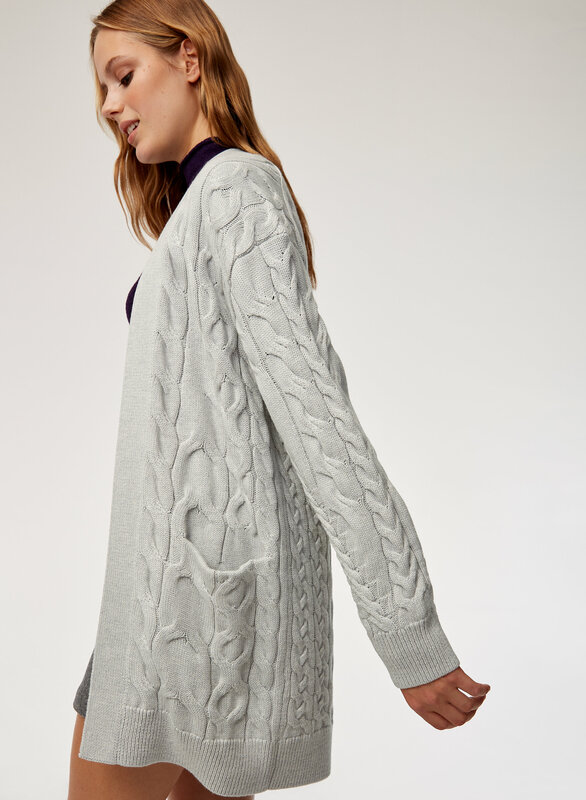 This sweater is lovely - the knit is divine and it is extremely soft. It runs very large - I bought my usual size, sized down, but the sweater is still quite oversized (could probably have even gone with an xxs!) and I haven't quite figured out how to style it for a more professional environment. Nonetheless, it is a keeper! Big comfy, and high quality. Looks great with a dress or pants. I love the detailing and quality of this sweater. The colour is warm and rich, the sweater is thick and toasty, while still stylish and elegant. I love this sweater!! It’s so cozy and I can dress it up, or even just wear it around the house! Love! 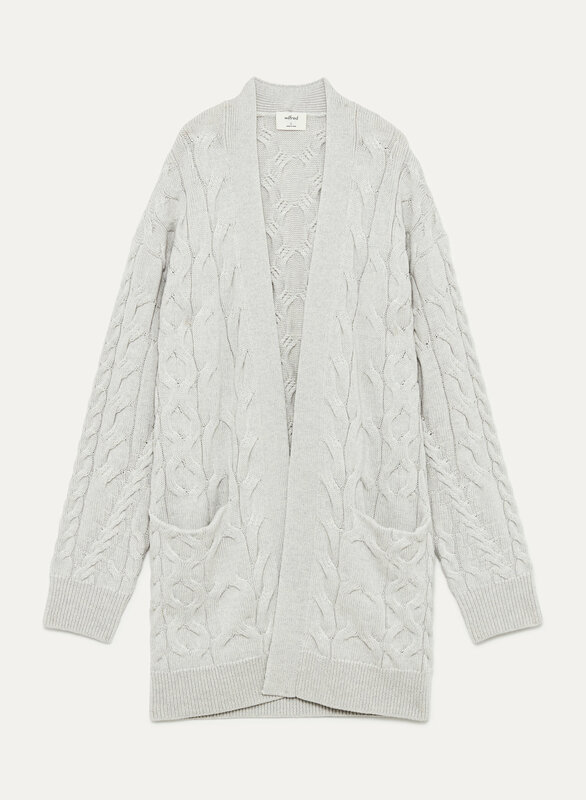 This cardigan definitely fits oversized, but still very flattering. I ordered the Tamarind colour thinking it would be more brown, but it's actually more green. Other than that, I love it! Beautiful silhouette. One of my favourite sweaters to wear, especially on cold winter days. This cardigan is one of my favorites. It’s soft and very stylish. I’ve gotten a lot of compliments. I love aritzia!! Purchased this as a birthday present for my Mom.. she loves it. Oversized, but so worth it! This is a great cardigan sweater with such a lovely unique knit pattern. It's oversized, yes, so if you want a less slouchy fit, size down. I bought two (one in medium and the other in small) and they're both great. I love wrapping myself up in this one. The knit is very soft, but feels heavy enough that it's quite warm and durable. Love love love this cardigan. I have it in almost every color! It’s gorgeous on. It runs a little big so I suggest sizing down a size. This cardigan is very soft and beautifully made. I love it! It runs rather large so I went down a size and being petite the XXS fit well and isn’t too large for my frame. Love the extra fine merino wool and the knit pattern. Could fit a little more precisely, even for a big sweater. Will have to see how durable it is as Aritzia knits are hit or miss. I was pleasantly surprised by how soft (not stiff and not itchy) this sweater is. It has a slightly oversized fit which I'm happy with, I personally would recommend ordering your usual size or even size up to get that nice oversized shape/fit. The colour Fromme is amazing, very slightly less olive in tone and a bit lighter than the photo online. Love the fit, love the cable knit, gotten lots of compliments on it! The cardigan is really nice and thick! The material is great! Love this sweater as it’s made with quality fabric and construction. I find it does run long on the sleeves and sometimes have to roll the cuff up.